We offer an extensive range of packing materials including boxes, tape and bubble wrap, which we can pick, pack and dispatch for our clients. We either use our own logistics management system or are happy to work with our clients to use their own current computer systems. Here are a few general things you need to know about packing your Personal Effects if you are planning to ship it as Loose Cargo by Air Cargo or Ocean Freight. We suggest that you pack your Household items like Clothes, Beddings, Dishes, Computers, Home Electronics, etc in Double Walled Boxes. The double walled boxes are stronger and are Heavy duty. Do not ship half-filled boxes or leave empty spaces in the box. 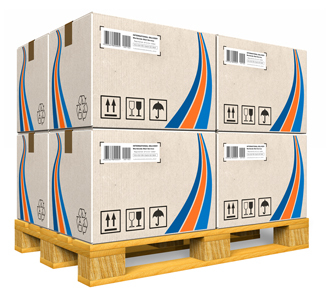 In shipping business, one box is frequently stacked upon another. Empty spaces in the box can sometimes allow the content to move freely causing damage to the items and package. You also run a risk of a heavier box crushing the half-filled box. When shipping Fragile items or Breakables, always pack items tight to avoid shifting, and make sure you pad & cushion the items with clothes, bubble wraps and packing peanuts. Make sure all sides of the box are tightly taped. You can put tape all around the box but don't cover your name and address with the tape. Books are Heavy; we suggest that you pack them in Book Boxes. The Book Box size is usually 13"x13"x17". You can also pack books in a Double Walled Box (18x18x28) but make sure that you mix Books with other light items to make boxes less heavy. Packing in Suitcases is Ok but sometimes they tend to break by the zips in long transit. If you pack in a suitcase, make sure that it's strong and of a good brand. Furniture requires special handling and can only be shipped using specialized carrier service, which is somehow expensive. Unless you are shipping Furniture in your own Ocean container, we can only ship Furniture when it’s packed in Wooden Crate or packed by professionals. Medical Equipments, Large Photo Copiers, Printing Machines and Delicate Equipments need to be shipped in a wooden crate. Labeling plays an important role in shipping and is part of the shipper's responsibility. Make sure you label Boldly and Clearly the sender names and the Consignee’s full address and phone number on the two opposite sides of the box. Cargo Express Worldwide Ltd also handles dangerous goods, please do not hesitate to contact us about these commodities.